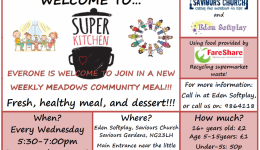 Joining the war on waste – Super Kitchen! Ok so we’ve had some feedback about making our party packages more flexible, so here it is! You can book a basic package then add to it with any features you want! We hope this makes parties a bit more exciting for everyone! Information about parties is available here. Have Your Child’s Party at Eden Softplay! Do you live in Nottingham or the surrounding areas? Are you looking for the perfect place to have a party for your child? We can help. Eden Softplay is well equipped for children’s parties of all ages.